There are times when I question my sense of adventure. Is it ever a good idea to climb to the top of a gargantuan sand dune that is growing taller by the minute because there is also blinding mini sandstorm? The answer is probably not. But somehow my memory has edited the more painful parts of my ill-conceived adventure to the top (here’s a tip: NEVER bring your digital camera to the top of a sand dune because cameras don’t work when there is a pound of sand in them!) and has only left the great, very hard-earned view… and I believe that is how I have sustained my sense of adventure: fantastic memory editing and of course gaining amazing experiences along the way. Our road trip started in Marrakech. I had visited about five years ago, but welcomed the opportunity to be back, especially with the cheap RyanAir flights that recently started flying directly from Bologna. Also, I was looking forward to some great chicken tajine and couscous! Moroccan food is often cooked in tajines, or heavy clay pots that slow-cooks food so that everything is very tender and all the flavors of the ingredients blend together organically. Couscous is never served in or with a tajine, and trust me- they look at you funny if you ask for a side of couscous with your tajine dish. 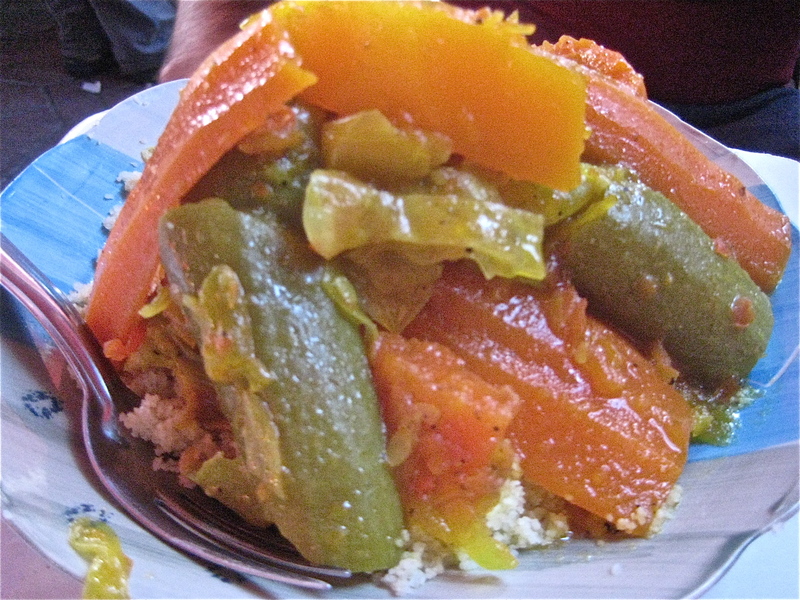 Depending on where you are in Morocco, tajines may have slightly different ingredients. 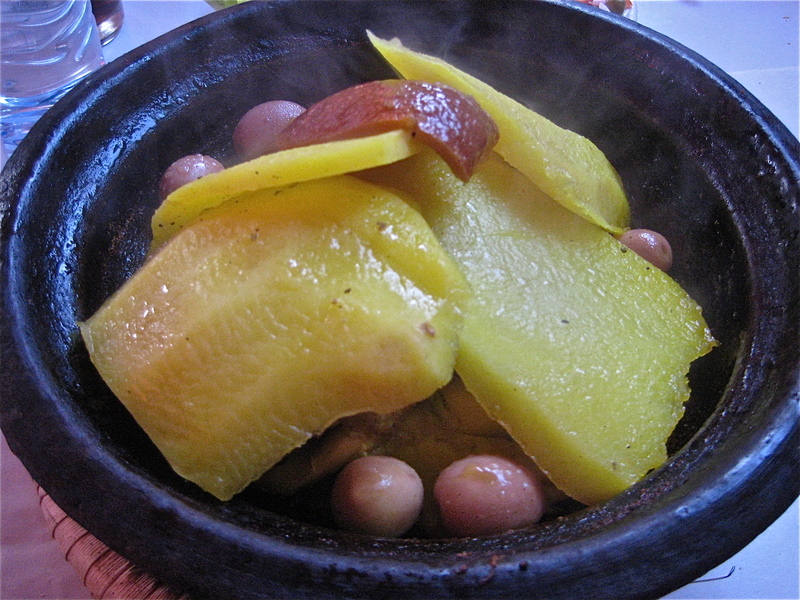 In Marrakech, the chicken tajine contained olives that were cooked with the rest of the dish (chicken is hidden under the veggies)- elsewhere in Morocco, they may contain some strongly flavored local berries that add a bit of tartness to the dish. Couscous dishes are served with chicken and/or vegetables. The chicken and vegetables are stewed and served over couscous. One of the main attractions in Marrakech is Djemaa el Fna, the chaotic/fun main square in Marrakech, where you can get your fill of trained monkeys, street performers, miniature bowling games, snake charmers, fortune tellers, and delicious food stalls. 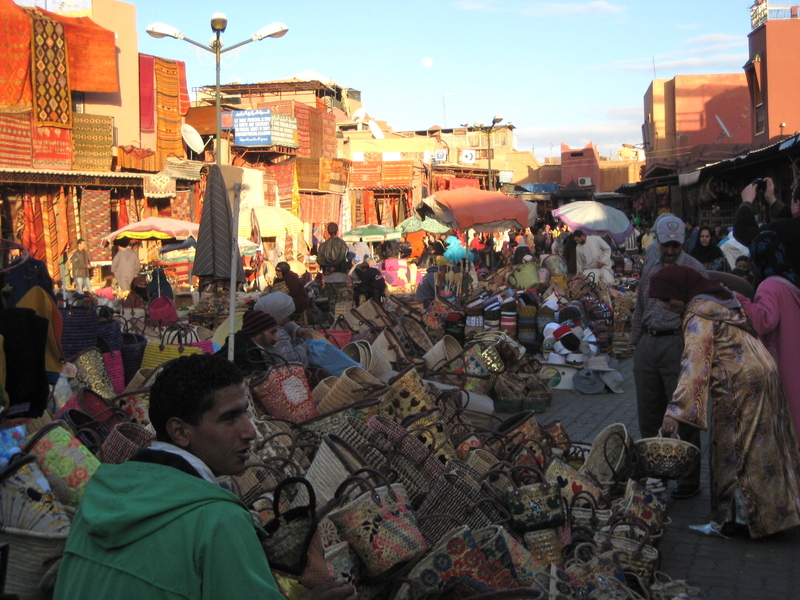 However, the Medina, or “old” section of Marrakech isn’t always an easy place to be a tourist. Finding your way around the tiny, nameless streets for the first time can be frustrating, even if it is just back to your hotel. 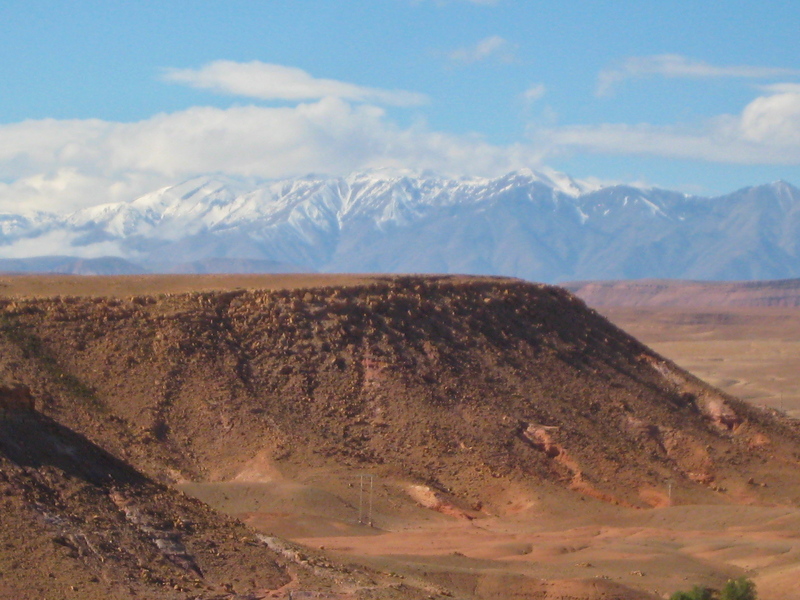 There is no stopping—once you stop to look at a map, Moroccan teenagers approach you to provide some directions, for a fee, of course. So tourists (including us) would always huddle in corners, facing the wall, just to take a quick look at the map to avoid being confronted by unsolicited help. 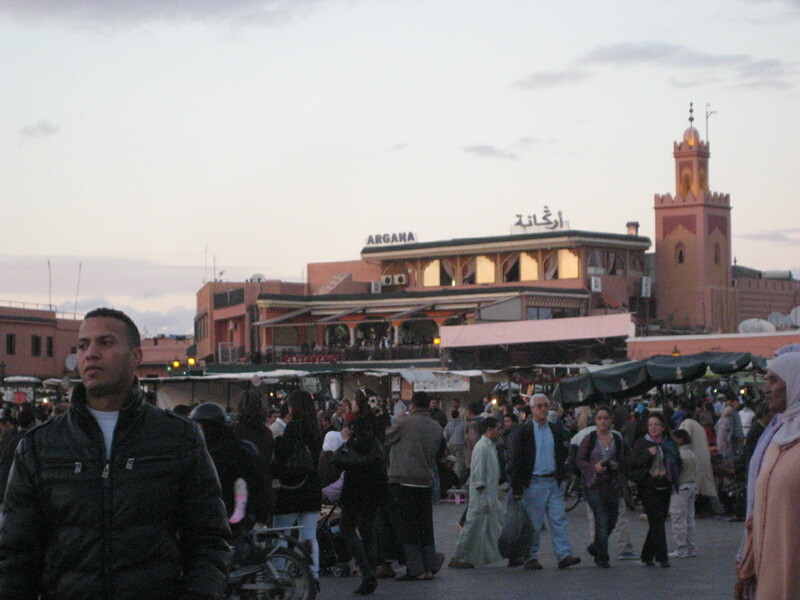 There is also “new” Marrakech for those that prefer a more modern perspective of the city and more organized streets. 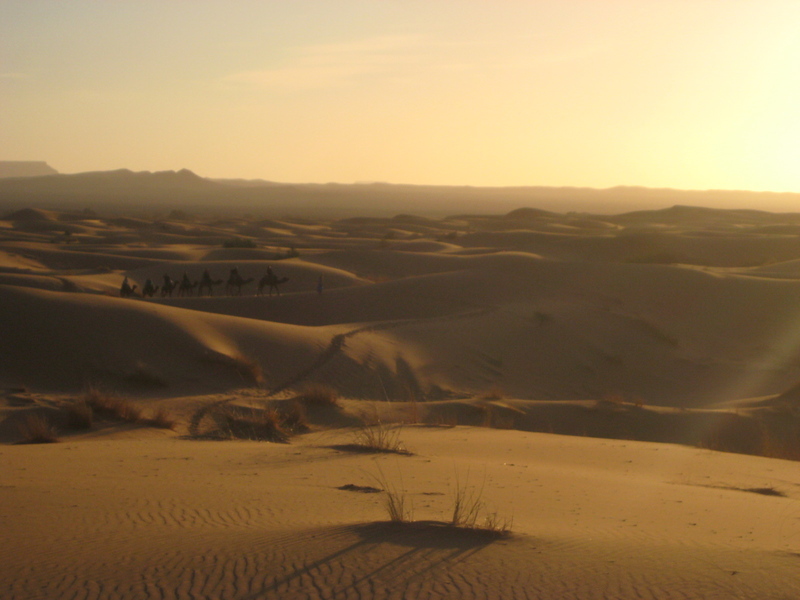 We wanted to get away from the chaos of Marrakech and see the Sahara, so we booked a last minute desert tour from Marrakech to Merzouga, where we can take a camel ride through the famous sand dunes and camp over-night. It was a three day, two night west-east cross-country trip with about 80% of the trip spent either in the mini-bus with 10 other very international tourists or on camels. Luckily we had a fun group and entertained ourselves with world capital and movie-star road trip games, random conversations (from the explanation of the show Doogie Howser, M.D. to one traveler’s adventures working for a burger joint in Australia), as well as the highly addictive Monopoly app on my phone. However, there were amazing sights outside our window throughout the entire journey. On one of our lunch stops, I tried kefta— Moroccan meatballs served in a tomato-based sauce, with a cooked egg on top. I wasn’t sure what the kefta was made out of, but the meat was a bit game-y (tasted like a combination of super game-y lamb and beef) with a mysterious texture. However, I was incredibly pleased with the concept of a stewed meatball dish in tomato with an egg on top, so I might try to make this at home and not eat it at a road-side restaurant in the middle of the desert. 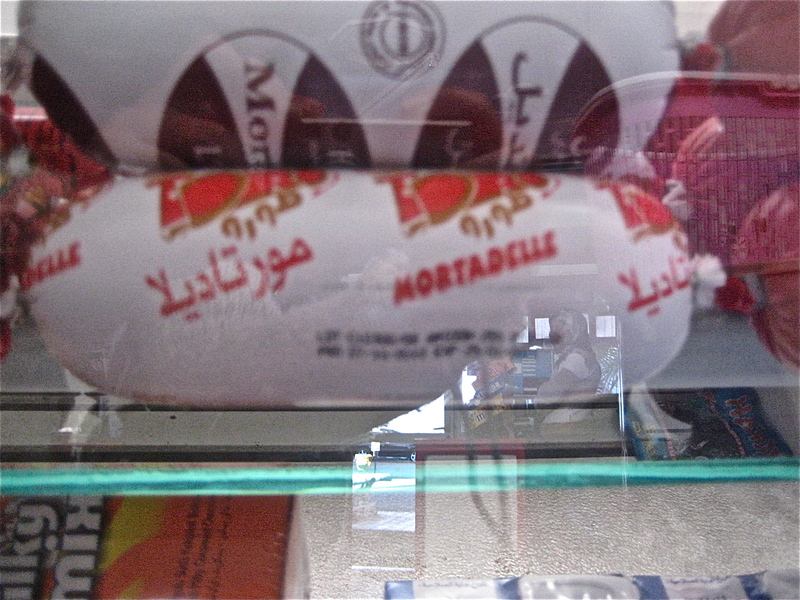 Also- found some mortadella at a Moroccan gas station! Nope, not willing to venture that far. 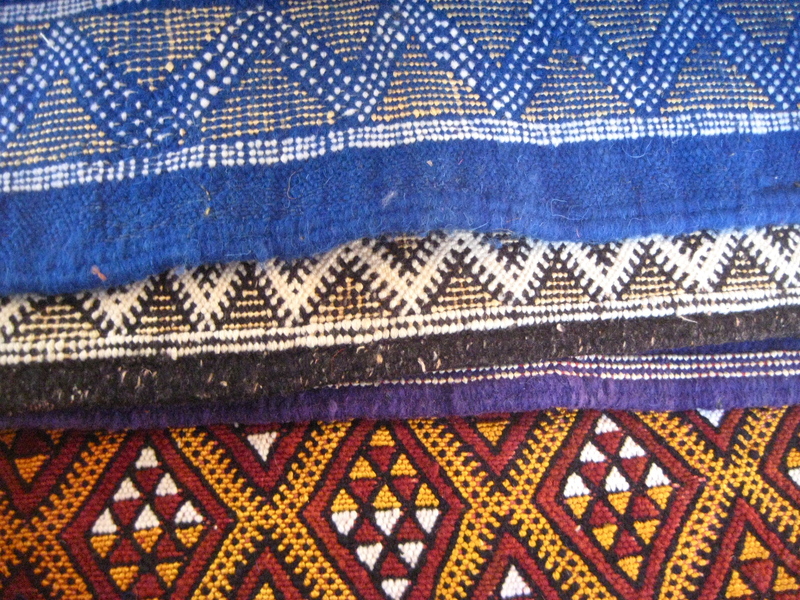 The long trip included short excursions at various points of interest, including interesting rock formations, gorges, the site where the movie Gladiator was filmed, and Moroccan carpet “demonstrations”, AKA a marketing ploy for tourists to buy their carpets after an eternity in awkward silence time (if you are actually in the market for a Moroccan carpet, they are absolutely beautiful and handmade, by the way). Arriving in Merzouga was somewhat of a momentous occasion- we had been traveling for days at this point, and finally reached our destination at sunset. 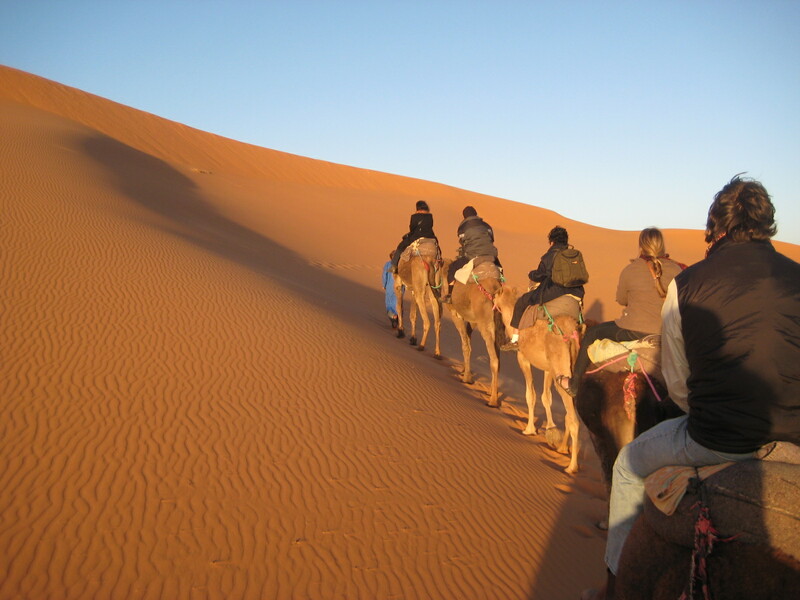 We all hopped on our camels and set off on our 1.5 hour camel ride to the campsite in the Sahara. My camel, who I named Luigi (although I think he was actually a she), was very well behaved and did not spit or freak out, like the worst-case camel scenario I dreamed up in my head. The ride through the desert was absolutely surreal: just miles and miles of emptiness, sand dune after sand dune, a la Indiana Jones and Conan the Barbarian. Our good-natured Berber guides (the Berbers are traditionally nomadic people who are believed to have first settled in Morocco) cooked us dinner in a large tent and entertained us with Berber songs and delicious mint tea with sugar, or Berber whiskey, as they call it, since alcohol is not officially served in most of Morocco. 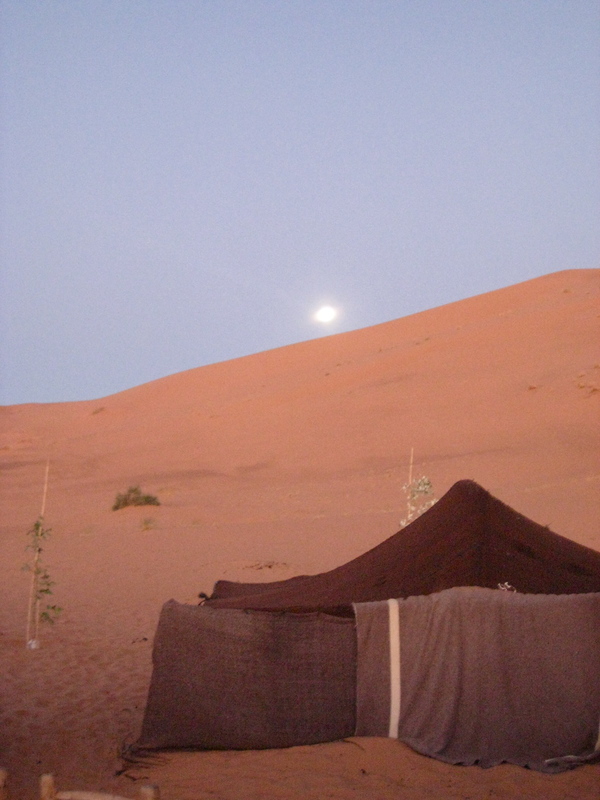 But after my completely voluntary, never-ending climb to the top of the gigantic sand dune, where my camera became completely defunct, and a rather sleepless night in the tent in the desert, I was ready to leave the desert, as it was getting a little too REAL for me. I hadn’t washed my clothes or showered in a while, and oh, I had a ridiculous amount of sand everywhere. It is still in my luggage to this day. After about 10-12 hours straight of camels, driving, restroom stops, and car games, we finally made it back to Marrakech. The hectic night market at the main square was still going in full force, and we stopped there for our last Moroccan meal before heading to Paris in the morning. The food stalls at the main square presented all kinds of options- grilled meat skewers, fresh squeezed orange juice, offal, dried fruit, whole sheep heads…you name it! We decided on freshly fried fish, which was delicious and welcome change to the inifinite amount of tajines we’ve eaten at this point. 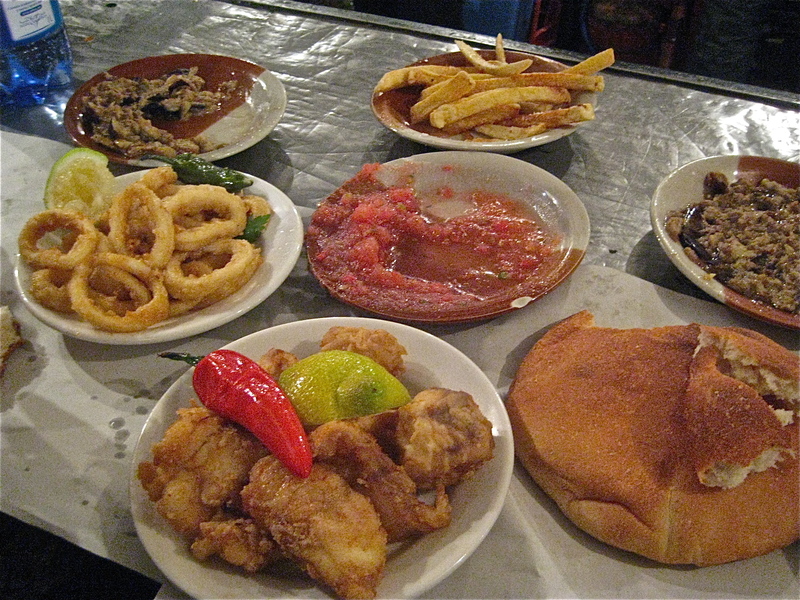 It was served with a flavorful, smoky marinated eggplant side dish, a tomato based salsa, and warm Moroccan bread. We sat at the stall with our newfound road trip friend and feasted on our colorful spread of night market food as we reminisced about our trip and plucked sand out of our eyebrows.